Yes, it'd be great if there could be some sort of named parameter convention for the humble insert statement! I like it. Horizontally? You mean you exceed the 80-90 character limit on a page? I'm aghast. That could work, I've just never found scrolling to the right very easy or very fun. Perhaps it's all in the mouse? I'm not familiar with the Ruby hash...looking at it though, yeah, it sort of does. 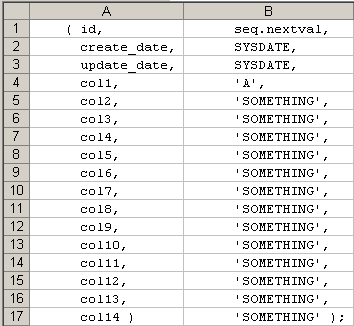 I think I had in mind named notation, the PL/SQL construct. I wouldn't mind seeing it though. Makes it much easier to get your values parameters right (there's only 1!). Although there are definitely some reasons why you might not want to use this method for updates etc. That's a rockin' great idea! I can't believe somebody hasn't thought of that. The whole insert scene is such a pain. Yeah, I know, that's a bunch of crap that's a pain in the arse. But it made sense to me for a while. Which, yeah, isn't great either 'cause sometimes 5 column names or values don't fit on a line. So there's no real way using fancy formatting to organize anything. Your suggestion though ... freakin' A man, that's the way to go! Chet, I was just thinking that the named parameter approach would be terrific for INSERT... but google show me that you beat me to it! I even created an Idea at Oracle Mix, you can see it here. I should update the post with that link as well. We just need to keep drumming up support then...to get everyone to vote for it. Maybe they'll listen! Why don't the little arrows point towards where the value is going to? (I believe that was my thought when first exposed to the pl syntax). Never thought about that...would be very interesting though. The named approach is a GREAT idea. But why bother with an arrow ??? Just an equal sign will do (think assignment).